Fuente, David, Jane Kabubo-Mariara, Peter Kimuyu and Dale Whittington. 2017. “Assessing the Performance of Alternative Water and Sanitation Tariffs: The Case of Nairobi, Kenya.” EfD Discussion Paper Series 17-21. Policy makers and utility managers can use a variety of tariff structures to calculate customers’ bills for water and sanitation services, ranging from a simple flat monthly fee to complicated multipart tariffs with seasonal pricing based on metered water use. 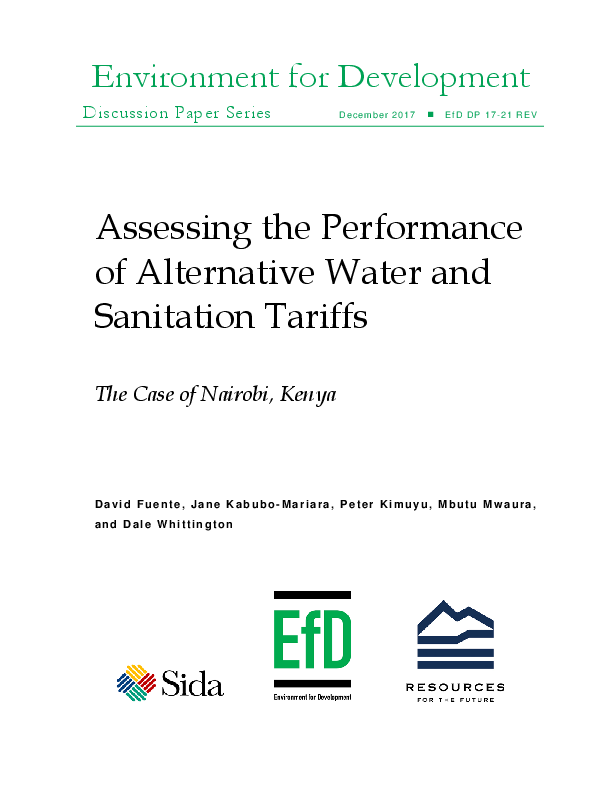 This paper examines the performance of alternative tariff structures for water and wastewater services in Nairobi, Kenya. In particular, we evaluate the performance of alternative tariffs relative to several criteria: the overall quantity of water sold (i.e., conservation), the magnitude of the total subsidy delivered through the tariff, subsidy incidence, change in customer welfare, and change in social welfare. To accomplish this, we develop a dynamic tariff simulation model and use a complete set of billing records from Nairobi City Water and Sewer Company to model the performance of alternative tariff structures. Contrary to conventional wisdom, we find that tariff alternatives with a uniform volumetric price perform as well as or better than increasing block tariff alternatives across nearly all policy-relevant metrics of tariff performance. These findings hold at the three levels of cost recovery that we consider and are robust to a wide range of assumptions about consumer behavior. This finding stands in stark contrast to the widespread use of increasing block tariffs (IBTs) in low and middle-income countries and to current perceptions of best practice in tariff design. Additionally, we find that neither the size of the lifeline block nor the number of blocks affects the relative performance of the IBT tariff alternatives in a policy-relevant manner. Finally, our simulations underscore the benefits of getting utilities on a path to improved cost recovery. This will be essential to ensuring governments have the resources to invest in climate resilient infrastructure and to meet the Sustainable Development Goals’ aspiration of ensuring universal access to safe water and sanitation services.